underwent a laboratorial study prior to the conservation treatment. 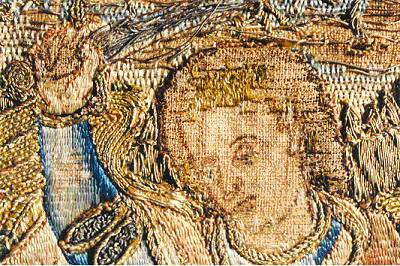 The analyses gave vegetable fibres for the support layers used in the embroidered strips (orphreys), in the applied embroidered figures, in the volume in-filling threads of those applied embroidered figures, and the intermediate linning support layer. 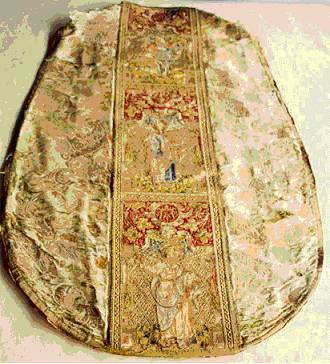 The patterned silk, the back linning, and the embroidery threads of the orphreys are made of ungummed silk. Trough X-ray fluorescence spectrometry the main component of the metallic embroidery threads was found to be silver, although other metals were also detected. These results together with the observations made using a metallographic microscope and a scanning electron microscope suggest that the golden threads should be gold plated silver, which was commonly used between the 15th and 17th Centuries. There is also a description of the condition survey and treatment intervention, which includes the application of an nylon support as a consolidation method on the embroidered figures, opposed to the traditional method, which was thought to be inadequate for the present case. stem stitch, chain stitch, long and short stitch. 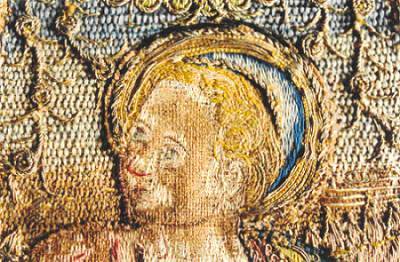 embroidery deterioration, face sketched on the line perceptible. on the front and on the back. 16th century, Spain (?). 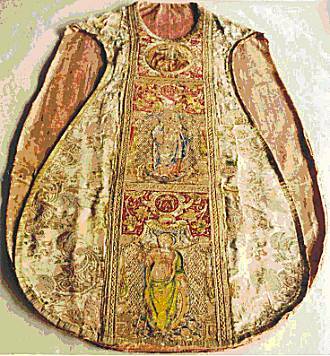 Late 17th French fabric.